Providing Tribal Members With Information. The Absentee Shawnee Tribe is primarily located in the heart of central Oklahoma with approximately 4,343 as of 3-7-18 enrollment record living in all parts of the world. Our tribal government complex is located in Shawnee Oklahoma. Our logo features Tecumseh, a Shawnee warrior and visionary leader, who worked to unite tribes in a common homeland where Indians could live under their own laws and leaders. He died in October 1813, in battle near the area of present day Thamesville, in Toronto, Canada. The LI-SI-WI-NWI in our logo means "Among the Shawnee". 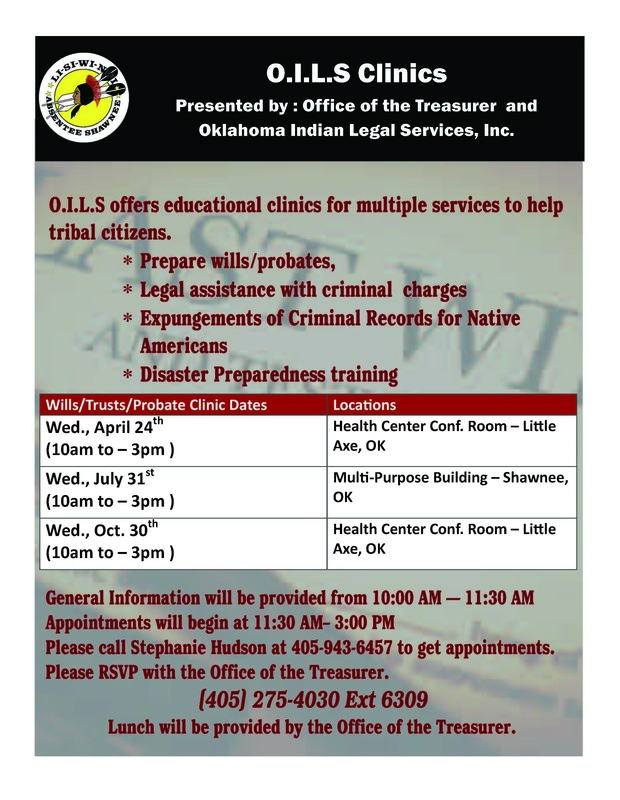 The Absentee Shawnee Tribe is hosting tax preparation for AST tribal members, widows/widowers of AST tribal members and employees, who meet the low-to moderate maximum income threshold of $55,000, for tax year 2018. This free service will be held at Shawnee Multipurpose building, 2029 South Gordon Cooper Dr, every Tuesday and Thursday evenings from 5:30 pm to 8:00 pm. and Saturdays from 9:00 am to 12 pm. The Executive Committee has agree to close all businesses (complex closed) on Thursday, February 28, 2019 for a "Day of Mourning" for John L. Sloat First AST Governor and 2014 Oklahoma Military Hall of Fame Inductee. He served in the Korean War and 2 tours in the Vietnam War. He served his country with pride and honor earning several high commendations that included two Silver Stars, two Bronze Star Medals and three Purple Hearts. Tax Preparation for Tuesday, February 26th and February 28th has been canceled. The next session will be Saturday March 2, 2019 from 9 am to 12 pm at the Multipurpose Building located at the Absentee Shawnee Tribal Complex. The Beading Class that was scheduled for Thursday, February 28th has been postponed.It has been rescheduled to a later TBA date. Beading Class that was scheduled for tonight has been postponed. The Part two Class will be on February 28th at 6pm at Little Axe Resource Center in Little Axe. 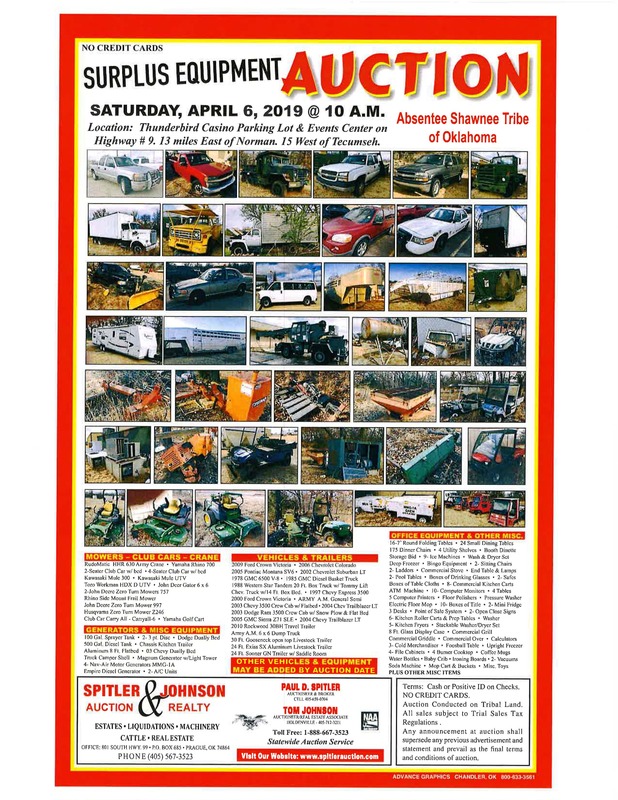 Please contact Kim Billie at 405-275-4030 ext 6416 for any questions. All Tribal Members and Employees Tax Preparation will not be available on Saturday February 16th 2019, due to the Holiday. Will resume services on Tuesday Feb 19, 2019.